so i was extremely pleased when i received a free mascara with my Elle subscription at the end of January. I was running out of my Lash Blast and Bad Gal, and i was thinking i would like to try a new mascara. I use three mascaras on my eyes. Bad Gal is really good for intensity, it makes my eyelashes really dark and i like that ’cause i don’t like to wear false eye lashes as i muck up my eye make up when i try to put them on. 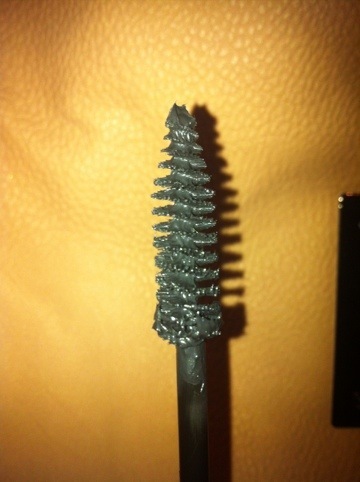 After that i put on my Covergirl Lash Blast, i LOVE the brush wih this mascara it helps separate the lashes. Then after that i’ll use my No7 Extreme Length on my bottom lashes. So i thought i’d use the Soap and Glory Thick and Fast Mascara which i got free with the magazine. I decided to use it instead of the Bad Gal as the brushes look really similar. The first time i used it i was going on a night out, so i was really careful when applying it, and i was really impressed with the outcome and how much coverage of the lashes that it gave. The second time, however, i think i was just going to work maybe, i cant remember. So i just kind of rushed it and then went to the mirror closely and i had mascara gloop EVERYWHERE…i wish i took a picture it was horrific. my lashes are quite long so when i am applying mascara i need to pretty much close my eyes so the tip of the lashes wont hit my eyelid. so i corrected the make up and took a closer look at the wand. you can see it in this picture…at the bottom of the wand there is so much excess mascara there and even at the tip too. i was really disappointed in this product and thankful that i received it for free because i definitely would not buy it. it may be a cheap mascara at only £10 (yes thats cheap…i hate my new “anything under £15 thats a make up product is crap” attitude…that’s where my money is!!) but i would rather buy a cinema ticket than buy that. and i would tell anybody this.